I’ll have a recap breaking down the 100 by position, by high school and by college. I’ll also rank the out-of-state commits to offer an idea how I view them against some familiar names. But for now here’s the final edition of the Inside Texas Top 100 for 2015 recruiting rankings. 1. 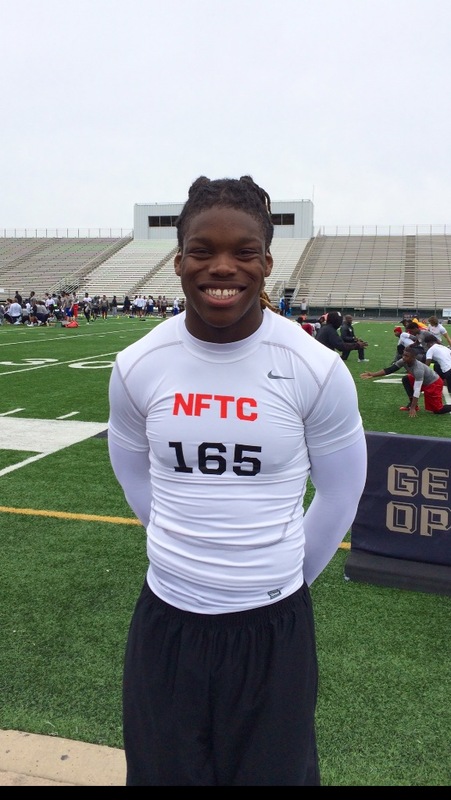 LB Malik Jefferson, Mesquite Poteet (Mesquite, TX) – Texas: Jefferson received stiff competition from Murray, Stidham, and Mack, but in the end I went with him because, though he’s a sensational athlete, he’s still nowhere near maxed out. He has tons of physical growth ahead of him as well as on-field growth. He has the mind component to maximize and is a natural leader. Those guys hit their ceiling, especially when paired with a development-minded coach like Charlie Strong. 2. QB Kyler Murray, Allen (Allen, TX) – Texas A&M: He’s the best high school player in the nation and if he was 6-foot-2 he’d be the best prospect as well. Though his height isn’t ideal (5-foot-10), he has so many traits that help compensate; anticipation, vision, arm/release, and uncommon quickness and acceleration. He’s a pocket passer who can run, more Russell Wilson than Johnny Manziel. He does have that Manziel reverse-out when receiving pressure from the blindside, at which point he either keeps his eyes downfield and finds his man or takes off running. Either way your goose is cooked. Cerebral, composed, fundamentally sound and athletic, Murray is everything but tall, including a draftable baseball prospect. 3. QB Jarrett Stidham, Stephenville (Stephenville, TX) – Baylor: Stidham is more RG3 than Bryce Petty because he’s a quick, fluid athlete, who would play wide receiver in college if he wasn’t such a good quarterback. His frame projects nicely but he’ll need to add some weight. He has good touch on the deep ball and the arm to target all areas of the field. We know he’ll be developed and surrounded by tons of talent. That’s half the battle. 4. DT Daylon Mack, Gladewater (Gladewater, TX) – Texas A&M: Insanely explosive off the ball, as well as powerful, Mack will play early at his school of choice. He’ll need to focus on keeping his weight down and remaining light on his feet. Worst case scenario he’s a quality space-eater. Best case, he’s an absolute factor defending the run and getting after the quarterback. 5. CB Kendall Sheffield, Fort Bend Marshall (Missouri City, TX) – Alabama: The cornerback Vitruvian Man, Sheffield is how you draw up the modern defensive back. He has good length, solid ball skills, and elite make-up speed. He’s also as fluid as you’ll find in a 6-foot-0 corner. He’ll have some footwork issues to commit to memory but that will come. Nick Saban comes into Texas for the 2nd year in a row and pulls the top corner. 6. CB Kris Boyd, Gilmer (Gilmer, TX) – Texas: Boyd’s even bigger than Sheffield but more raw. He’s a good enough athlete that he could play running back or wide receiver in college, but his best value is in the secondary where he projects to everything from nickel, corner or safety. He’s a quick-twitch athlete who is also physical. He’s raw, but has so much size and athleticism he’ll be useful early in his career. 7. RB Ronald Jones, McKinney North (McKinney, TX) – USC: Jones is a homerun hitter who breaks ankles and angles alike. He’s a tightly wound athlete who explodes through the hole. His tackle breaking ability stems from velocity rather than size. As he physically develops, he’ll become more powerful between the tackles and a more well-rounded running back but he’s a big play threat the second he steps on campus. 8. WR Damarkus Lodge, Cedar Hill (Cedar Hill, TX) – Ole Miss: The most polished wide receiver to come out in years, Lodge will challenge for early playing time regardless of where he ends up. He runs the whole route tree, makes plays in the air, splits seams on the ground, make big plays in the screen game, and is used on end arounds. There’s a reason I refer to him as ‘high school Jerry Rice’. He’s not the most explosive player you’ll ever see, but he doesn’t get caught from behind. He’s not the most physically imposing receiver you’ll ever see, but he makes 50/50 balls 90/10. He won’t have the same physical advantages he enjoyed in high school, but that’s where his skill as a route runner will bail him out. 9. S Deionte Thompson, West Orange-Stark (Orange, TX) – Alabama: With SEC offenses experimenting with the forward pass over the last few years, do-it-all safeties are a must. Thompson has great range and ball-winning skill (he could also play wide receiver) and though he’s slight of build, he’ll hit you with everything he has. He has the type of length that closes passing windows quickly, something that will frustrate opposing quarterbacks. 10. OL Maea Teuhema, Keller (Keller, TX) - LSU: Teuhema projects as an athletic and mauling offensive guard. He could stay at right tackle – he has the length – but his greatest utility is at guard. He’s athletic on the move and finishes blocks like no other. LSU loves to run right at you and guys like Teuhema will make that hard to stop. His size and power alone are tough to deal with, factor in that he bends well and plays with good pad-level and you have yourself a force in the interior. 11. RB Chris Warren, Rockwall (Rockwall, TX) – Texas: You’d be hard pressed to find a smoother, more nuanced tailback at 235 pounds. Warren has the subtle skill of the best running backs; good feet, balance, vision and feel for the cut-back, he also finishes runs like you’d expect from someone that size. He has the mentality of a professional already (thanks, Dad!). Just when you think he’s a power-back, he takes one in from 60. Get him in an offense that wants to assert the run and watch him wear defenses down. 12. CB Holton Hill, Lamar (Houston, TX) – Texas: Perhaps the most technically skilled corner in the state, Hill is also long (6-foot-2) and surprisingly athletic and fluid. He made tons of special teams plays this year that displayed athleticism I wasn’t quite sure he had. He can be a physical, press-man corner or play off. His length helps tremendously in man and zone. He’s a bit narrow in his shoulders so I don’t foresee him at safety, but that’s fine because I think he’s a can’t miss corner. 13. S Deshon Elliott, Rockwall-Heath (Rockwall, TX) – Texas: Elliott runs the alley just like you want to see out of your box safety, and has the size to make his ill-intentions come to life. A sure tackler, Elliott shows plus closing ability in the open field, a must in the Big 12. Some initially thought Elliott would become a linebacker – a tribute to his size and physicality – but I believe he covers well enough to stay at safety. Pair him with Jason Hall and Texas should have an imposing duo at safety with coverage ability. 14. S Larry Pryor, Sulphur Springs (Sulphur Springs, TX) – Texas A&M: Pryor/Elliott was a tough call. I went with Elliott because I think he’s a tad bit more explosive and fluid, though Pryor is just as physical and has better ball skills. 15. RB Soso Jamabo, Plano West (Plano, TX) – UCLA: A gifted athlete, Jamabo is in a bit of positional purgatory. Is he a running back or a wide receiver? He’s too athletic to not find a home, but I like him at receiver where his physicality – or lack there of – translates better. 16. RB JaMycal Hasty, Longview (Longview, TX) – Baylor: A daylight runner, Hasty bursts into the open field like few. ZR with Stidham and Hasty is going to be an athletic duo for conference foes to defend. Hasty’s still not much of a contact runner so he doesn’t project to get hard yards between the tackles, but get him in space or feature him in the screen game and he’ll blow open some games. 17. PJ Mbanasor, Hendrickson (Pflugerville, TX) – Oklahoma: Physical corner who could play safety if that’s how OU gets its five best defensive backs on the field. Mbanasor shows good field awareness, and plays the run well, often fighting off blockers to do so. He’s not the most explosive athlete so I think you prefer him on bigger receivers over quick, shifty ones. 18. OT Ronnie (Buck) Major, Huntsville (Huntsville, TX) – Texas: Kennedy Estelle starter kit. Major is a highly raw, yet gigantic right tackle prospect. He shows the movement skills required to stay on the edge, but fundamentally he has a long way to go. Unfortunately for him, he may go the Juco route. Not ideal for a player who needs the best coaching possible. 19. OT Keaton Sutherland, Marcus (Flower Mound, TX) – Texas A&M: Sutherland’s done well to put on needed weight. He’s obviously working hard too because he’s kept the movement skills that made him such an intriguing prospect at 260 pounds. Now around 280, he could be a future left tackle. 20. WR Carlos Strickland, Skyline (Dallas, TX) – California: Catch radius and ‘good enough’ long speed typify the big outside receiver. If he’s not open on the field, he’s open above it so throw him jump balls. Long strides make him deceptively fast and he shows good agility for being his size. He’ll be a guy who runs 7’s, 8’s and 9’s on the route tree and should become a physical down-field blocker. 21. LB Anthony Wheeler, Skyline (Dallas, TX) – Texas: Wheeler’s come a long way as a football player; from playing a stand-up defensive end as a sophomore to inside linebacker the last two years, Wheeler has matured a ton both physically and mentally. He reads flow well, takes on blocks with the proper shoulder and has solid closing speed. He has a tremendous body projection, I’m talking first off the bus in The Longest Yard type of look. 22. WR Blake Lynch, Gilmer (Gilmer, TX) – Baylor: Lynch has the look of a quality WR2 at Baylor. Maybe not the guy who blows the top off, but the guy who runs smooth routes and moves the chains. He has excellent size and solid short-area quickness which will help with route running. Smart kid, too, so mastering the playbook won’t take long – especially that playbook. 23. DE Louis Brown, Burton (Burton, TX) - Oklahoma State: You’ve heard of catch radius – Brown has a huge tackle radius with his long limbs. Coming off the edge he’ll project to running the arc well, and dipping and ripping. Nobody has any clue how good he’ll actually be because he’s so raw but he has huge physical and athletic upside. He’ll get to 260 pounds with ease. Athletic enough that he could play tight end depending on where he lands. 24. S Justin Dunning, Whitehouse (Whitehouse, TX) – Texas A&M: The most logical projection for Dunning at this point is safety, but he could end up at wide receiver like Edward Pope did. Dunning has rare length and uncommon COD, but will he be physical enough to run the alley versus Alabama, Arkansas, LSU, and Auburn? I like him better in pass coverage than I do versus the run which is kind of odd for such a big safety. 25. DE Charles Omenihu, Rowlett (Rowlett, TX) – Texas: Watch Omenihu’s junior year film compared to his senior year and it’s apparent he’s much more comfortable being 6-foot-5 now than he was then. He’s got good bending which helps him play strong at the POA. He’s going to become a player once Moorer is finished with him. He has to get much stronger to hold up versus the run in college, but once he does and keeps his leverage, he’ll be tough to move. 26. QB Quinten Dormady, Boerne (Boerne, TX) – Tennessee: Has the physical/mental tools to play in a wide array of offenses. Great size/frame and deceptive athlete. Sees the field from the pocket or on the roll out. Throws a catchable ball; doesn’t over-cook throws. Good enough arm that will become stronger as he fills out and transfers his weight better. Has a slight hitch in his motion that slows it down slightly. He’ll start some games for Rocky Top. 27. OL Trevor Elbert, Rockwall-Heath (Rockwall, TX) – Texas A&M: If the Aggies ever decide to run the ball, Elbert may stick at right tackle. He has great size for the position and avalanches smaller d-lineman. His problem will be with speed rushers. If A&M continues to run its current offense, he’ll be a great guard for them; defensive tackles will have trouble bull-rushing and his quickness should be good enough on the interior. If he gets a little lighter on his feet, he may be a right tackle regardless of the offense. 28. C Patrick Vahe, Trinity (Euless, TX) – Texas: Left tackle bounce, center’s build, and pitbull mentality; Vahe looks to be a multi-year starter at center. He’ll excel on combo blocks and picking off bigger defensive tackles when he has the angle advantage. He’s also very athletic – moves like a jumbo fullback – so pulling duties, if applied, will come easily. All evidence points towards the cerebral aspects of the position (line calls) being in his skill-set. 29. RB Corey Dauphine, Memorial (Port Arthur, TX) – Texas Tech: One of the fastest kids in the nation period (20.76 200 meters! ), Dauphine also has an ideal football build. He’s as tightly wound of an athlete as you’ll find. He lacks some of the natural traits you look for in a running back, but in a slashing/draw run-game he should do damage. I must say he ran less impatient and frenetic this year than last, so I think RB is his future but if all else fails, he can play safety. He already runs with aggression and will look like an NFL safety by the time he’s a sophomore. 30. DL Du’Vonta Lampkin, Cypress Falls (Houston, TX) – Texas: If all you look for in a defensive lineman is ball get-off, you’re missing something potentially special with Lampkin. He comes with a collegiate upperclassman’s body and is surprisingly fluid for his size. Despite not being all-out sudden in his movements, he’s still a good athlete who could play nose tackle, 3-tech, 4-tech, or 5-tech. That’s tons of roster value. I liken him to a poor man’s A’Shawn Robinson and that’s still a good tax bracket to be in. 31. OL Toby Weathersby, Westfield (Houston, TX) - LSU: Weathersby’s a good athlete for the position; good enough that discussions of whether or not he can play the edge in college have some validity. I project him to guard long-term, where he should be able to stay in front of all but the most athletic d-tackles. He’s college ready in his upper body but will need to add lower body mass and strength to anchor. 32. OT Connor Williams, Coppell (Coppell, TX) – Texas: Some of his early offers came as a tight end so you know athleticism won’t be a concern. He also received offers at center, so intelligence is there as well. He’s still raw as a left tackle, but he as a lot of the traits you can’t teach; athleticism, feet, and length. His motor should make him a Strong/Wickline favorite. 33. WR Ryan Newsome, Aledo (Aledo, TX) – Texas: What sets Newsome apart from many ‘speedsters’ is he has loose hips/wiggle. He just needs the slightest bit of daylight before he slows down to not outrun it. He’ll be featured best on screens and in the return game. Some jet motion wouldn’t hurt either. He’s not that big, but he’s muscular and will only get stronger. In time he’ll break perimeter arm tackles which is often the difference between a 2-yard loss and an end-zone celebration. 34. OT Madison Akamnonu, Bowie (Arlington, TX) – Texas Tech: Extremely light on his feet, Akamnonu is easily the most athletic offensive lineman in the state. He’s a left tackle athlete if there ever was one. Two questions remain however, and they’re not the tandem you want. Can he add weight, and does he want to put in the work required to do so? If he embraces the grind, he should be cashing paychecks one day. 35. RB Rodney Anderson, Katy (Katy, TX) – Oklahoma: OU’s backfield is as talented as any team in the country so Anderson may need the depth chart to thin out a bit, but with his quality hands, the Sooners may look to get him involved out of the backfield or even in the slot. He has solid economy of motion; very little wasted movement. You don’t want to be on the wrong end of his stiff arm, either. He’s not a power back but he has good size and runs hard so he’ll break his share of tackles. He also has just enough wiggle in space to evade tacklers too. Isn’t the most explosive guy you’ll see, but he has a lot of tools. Now, how will he react to meeting contact at the LOS rather than eight yards down field? 36. RB Jordan Stevenson, South Oak Cliff (Dallas, TX) – Navarro JC: He may be small but he doesn’t know it. Don’t get me wrong, he is a speed back, but if he can’t run around you he’ll try and run through you. Love his determination that way. When the quarterback is under center, Stevenson is about as quick to the mesh-point as you’ll ever see. He slashes slivers of lane inside but has all the speed he could ever need to the outside. He’ll be hard for defenders to locate behind Wisconsin’s perennially gigantic line, but even when they do see him, can they catch him? He won’t be a high volume back like Melvin Gordon, but he’ll take it 10-15 times a game if you let him. 37. WR Deandre McNeal, Poteet (Mesquite, TX) – Texas: Lacks explosion and top-end speed, but other than that, he has it all. He’s tremendously fluid for his build (looks like a future ‘big’ linebacker) with innate coordination and ball skills. He’ll body defensive backs out of the way and go up and high point balls. He’s surprisingly elusive in the open field and if they use him out of the slot in the quick game, he’s going to get tough yards post-contact. I think he sticks at wide receiver but if he doesn’t for whatever reason, he can be many things. 38. WR Devontre Stricklin, Midway (Waco, TX) – Baylor: Originally Stricklin arrived on the scene as an outside deep threat but he’s evolved into a pretty nuanced receiver. He can run by defensive backs fine, but other times he gets them off balance with seamless planting and cutting. Often times WRs give up their routes at the top of their stem by chopping their feet, Stricklin doesn’t do that, or at least he doesn’t from what I’ve seen. He received great quarterback play from Ben Hicks. He’ll go on to Baylor and receive the same. Frankly I’m happy he’s not going to Texas because 83% of IT commenters would call him Devonte Strickland for all four years. 39. DB Roney Elam, Newton (Newton, TX) – Texas A&M: Probably the guy I struggled with the most to rank. He’s an athlete – a great athlete – but he doesn’t do much on film that tells me he’ll play corner anytime soon. He’ll require some time if that’s his future but if they can’t get him synced for that position, he still has a bright future at safety, but then he’ll require time to bulk up. In the end, he has nearly as much physical upside as Kris Boyd and Kendall Sheffield. The difference between him and a guy like Holton Hill is skill and about 5,000 reps at corner. As of now, he’s just a guy running around making plays, which, admittedly, is highly entertaining to watch. If for some reason defense doesn’t work out, he’s athletic enough to play receiver (defense will work out). 40. LB Semaj Thomas, Southwest (Fort Worth, TX) – TCU: A true ILB in every sense, James-spelled-backwards also has an extra bounce in his step. His combination of size, physicality, and explosive tackling should ensure a productive career at TCU. He also seems to have quick diagnostic skills. If he didn’t commit to TCU so early, he’d have much more hype. Don’t rule out the possibility he ends up with his hand in the ground. Remember, The Patterson loves to spin players down. 41. DE James Lockhart, Ennis (Ennis, TX) – Texas A&M: Lockhart was a big part of Ennis’ magical 2015. Where as I wasn’t a fan of Landis Durham as a fit for A&M, I think Lockhart fits perfectly as a 4-3 end. My main quibbles are lack of length (6-foot-2), I think he’s nearly maxed out (how much bigger, stronger, faster will he get), and he’s not particularly quick or violent at the point of attack. You know the phenomena of being overly critical the longer you’ve seen a player? Maybe I’m guilty of that to a degree because he’s been a known commodity for a long time, but I don’t think so. I do think he’ll play quite a bit after Myles Garrett declares in two years and may break the rotation before then, but I can’t predict superstardom. 42. CB Jordan Tolbert, Fort Bend Ridge Point (Missouri City, TX) – Baylor: He missed his senior season but I love his junior film so much I’m going to keep him ranked high. Had he stayed healthy and played a little better as a senior than as a junior, it would have been hard for me to keep him out of the Top 20. I view him as a cover corner with physicality, something you don’t see all that often. He has a build that projects to add nothing but quality weight and he has that hint of twitch in his step you want to see. I predict big things for Mr. Tolbert, and I can definitely see why he was a surprise offer at Texas Junior Day. 43. WR Kemah Siverand, Cypress Ridge (Houston, TX) – Texas A&M: The cheetah of the class, watching Siverand run is a beautiful thing. He’s the guy you throw open, or hit him in the seam and watch him split defenders. He has a lot of work to do to becoming a more well-rounded route runner but he has the coordination and athleticism to become great in that regard if he puts in the work. It’s a crowded depth chart but he’ll emerge as a player. 44. LB Cameron Townsend, Fort Bend Ridge Point (Missouri City, TX) – Texas: Townsend’s not your typical linebacker in that he’s 6-foot-1 and 205 pounds, but he’s well put together and strong, so even if he tops out at 220, he’ll be fine. He has a skill-set Charlie Strong can put to creative use. He may never become a gap-filling Will, but he could very likely be a LOS defending Sam in the mold of Eric Striker. Certainly not saying he’s Striker, but he can be deployed similarly. I love him chasing quarterbacks and ball carriers from the back side, and he is surprisingly strong at the point of attack, so running at him isn’t as easy as you’d think based on his size. He should be fine defending the flats and quick in his drops, but that will require reps.
45. WR JF Thomas, South Oak Cliff (Dallas, TX) – Texas Tech: He can make the dramatic catch in traffic or get YAC in the screen game. Big, physical receiver who runs well, but isn’t a blazer. Reminds me of Texas senior WR John Harris, but no other iteration of Harris. Thomas has obvious fits in the TCU offense as the guy who spreads the defensive vertically. He has the ability to punish in the open field and turn a lazy tackle into a big play. 46. QB Ben Hicks, Midway (Waco, TX) – SMU: I’m quite familiar with Hicks and was a fan long before his Elite 11 success. He’s not a great athlete but he has the maddening ability to escape, keep his eyes downfield, and deflate a defense that played the down perfectly until that critical point. He seems to always find the open receiver and hit him in stride. When the receiver is covered well, he puts it where only his guy can make a play. He holds the ball high, has a plus arm and effortless release. He goes through progressions. He does a lot of the textbook things you want to see without looking mechanical. I don’t imagine SMU has anyone on campus who will prevent him from playing early. 47. OL Connor Lanfear, Hays (Buda, TX) – Texas A&M: Somewhat similar to his future teammate Trevor Elbert, I knew Lanfear was flipping from Texas to A&M when he breathlessly told me he could see horses from Kyle Field. I quipped at the time that Sumlin was such a salesman that those horses were animatronic. Since those days, he’s definitely gotten close to be college sized. He plays through the whistle and is a good drive-blocker. I don’t think he’s a tackle athlete – his feet have gotten heavier as he’s added weight – but I’d bet he fits into the guard rotation at some point. 48. CB Josh Butler, West Mesquite (Mesquite, TX) – Michigan State: I had a lot of questions about Butler coming into the season and he answered them before he was injured and lost for the season. My thoughts on him before the season; fluid, cover corner with good ball skills. My thoughts now; better, more explosive athlete than I previous thought (as evidenced by numerous punt returns) and increased physicality while still camped out on the receiver’s hip. The next Trae Waynes? That’s a lot of pressure to live up to, but the future 1st round NFL corner was a 2-star coming out of high school. His NFL scouting report reads similar to Butler’s high school version. It’s uncanny. 49. ATH Jay Bradford, Splendora (Splendora, TX) – Texas A&M: I’m under no illusions Kevin Sumlin will get value out of Jay Bradford at running back after being unable to maximize superior talents Trey Williams and Brandon Williams the last couple years. 50. OT Bobby Evans, Allen (Allen, TX) – Oklahoma: Size is the only thing keeping Evans from being ranked more highly. While much of the OL focus at Allen goes to 2016’s Greg Little, Evans is just as nimble and dexterous. He shows good quickness and balance whether going forwards or backwards. He’ll be a guy who can get out in space and locate defenders in Stoops’ favored screen game. His brother, Tay, is a linebacker from Allen who signed with OU last year and their father once played basketball in Norman. 51. S Khalil Haughton, Midway (Waco, TX) – Oklahoma: I never understood why Texas backed off of Haughton after showing early interest. What if Mykkele Thompson was physical? Okay, Haughton’s not that fluid of an athlete, but he certainly isn’t stiff and is also has a predisposed defender’s mindset. He could sharpen his back-pedal some, but he’s quick and decisive out of it and shows quality acceleration and determination when coming downhill or breaking on the ball. He also has excellent length. Once they get him to his fighting weight, he could be special. We know he’ll receive quality coaching. 52. ATH Darrell Stewart, Aldine Nimitz (Houston, TX) – Michigan State: Once committed to Boise State, he’s now heading to Michigan State. I love both school’s evaluation and development. Stewart has been underrated to me throughout the process so I figured I’d give him his due. I project him to safety, but you know there will be no change-of-direction problems when I can also credibly project him to wide receiver. If he ends up on offense, his defensive traits will translate and vice versa. 53. DT Darrion Daniels, Bishop Dunne (Dallas, TX) – Oklahoma State: Daniels’ redeeming qualities are his baseline traits, namely size and movement skills. He still fires out too high and relies on overmatching power rather than skill, but he’ll get that ironed out. He’ll provide gap versatility as he can project from nose-tackle on out to 5-tech. 54. TE Jordan Davis, Clear Lake (Houston, TX) – Texas A&M: He’s more physically talented than this ranking indicates but he’ll be the invisible man in that offense unless they tweak it like Tech did with Jace Amaro. Even then, I’m not in love with his build for a flexed tight end. While ‘flexed tight end’ reminds you of striated glutes, I’ll continue. Davis has shown good 1v1 athleticism to the outside and the ability to high point. In the end, my main question is with all those talented receivers in College Station, do they remove one to add Davis? I don’t fancy him long-term as an in-line blocker, so that’s another knock. Talented receiver prospect, though. 55. ATH John Humphrey, Clear Falls (Houston, TX) – Oklahoma: I talk about fits all the time. Humphrey to Oklahoma is a great fit. There’s been some talk in the past regarding Humphrey to corner. Indeed he has the hips, make-up speed and length you want for the position, but he’s too valuable with the ball in his hands, especially in a slot-centric tunnel screen offense like OU’s. His start/stop acceleration is a must for the screen game and he is on the higher end when it comes to that. If the football gods allowed me to line-up the eight fastest football prospects in the state, Humphrey is one of them. 56. 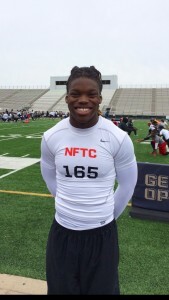 ATH Tre’Vontae Hights, Yoakum (Yoakum, TX) – TCU: Speaking of speed merchants, Hights can go. A quarterback in high school, I’m utterly perplexed if I want him at safety or wide receiver in college. Meachum/Cumbie will be fighting Patterson for his services. He’s a tremendously gifted athlete with good size and speed. They’ll likely let his disposition decide his future. I don’t know if he can mature physically to bring what Sam Carter does, but I do know he’s a superior athlete to future NFL safety. 57. OT Conner Dyer, Horn (Mesquite, TX) – Texas Tech: He’s not the athlete Bobby Evans is, but I have the same question; size. Dyer doesn’t a whole lot of things well. He plays with a flat back, brings his feet with him and guides defenders out of the way. He finishes blocks, a nice indicator of nastiness. Nice pick-up for Tech in a great OL class for them. 58. S Prentice McKinney, South Oak Cliff (Dallas, TX) – North Carolina: Notre Dame’s yearly schedule features a little bit of everything. There are no singular stylistic conference norms for them. McKinney, as a safety, should help them scheme everything from concentrated spread passing to running attacks to balanced WCO. McKinney also has great length, good range, and is also an explosive tackler. Give him a kill shot and he’ll take it. That works defending any kind of offense. If Notre Dame fans thought they were getting an Irish ginger based off his last name, they’ll be gladly mistaken. 59. RB Patrick Carr, The Woodlands (The Woodlands, TX) – Colorado: The easiest way to describe Carr is as a better BJ Catalon. I could easily see him excel in a spread attack because once he’s in space, it’s over. However, what’s always impressed me about Carr is his ability between the tackles. He’s incredibly quick to and through the hole and his smaller size helps him navigate the trees. Don’t let his size fool you; he’s powerfully built at 5-foot-9, 180 pounds and projects to carry even more muscle. 60. S Kenneth McGruder, Alief Taylor (Houston, TX) – Oklahoma State: Great size and build which we’re seeing more and more of these days. What separates McGruder from many is his size coupled with his footwork. He’s received good coaching at Taylor. I was partially sold at a camp where he uncharacteristically missed his jam, did an immediate speed-turn and caught up with the receiver to knock down the ball. Most 6-foot-2, 200 pound safeties don’t do that in 1v1. 61. ATH JW Ketchum, Lamar (Houston, TX) – Baylor: One of the better, more explosive athletes in the state, Ketchum also has tons of physical growth potential ahead of him. Because of that he’s been projected to everything from running back, wide receiver, and safety. If he has the hands, he’ll be a fantastic and fearless slot receiver, but if not, I think safety is a good bet. For Baylor, the need would likely be safety and I think that’s where Ketchum most easily projects. 62. CB Antoine Stephens, Kimball (Dallas, TX) Oklahoma: The late-to-the-party corner from Kimball caught recruiting fire this fall once his tape started making the rounds. Texas showed interest but then cooled once out-of-state candidates appeared more tangible. Now they’re getting back into contact. The kid can play. I love his size (6-foot-2, 180), physicality, and instincts. He noticeably baits quarterbacks and leaves his man to jump other routes. That’s awareness. I also think he’s a bit more explosive than he’s given credit for. Damn, I under-ranked him, but like I said, it’s a talented class, particularly at defensive back. 63. DE Michael Scott, Nimitz (Irving, TX) – SMU: Great length, basketball athlete. What are traits you want to have as a defensive end, for $500, Alex? Scott’s going to SMU to play with his twin brother but he had much more prestigious offers. He shows a good first step, for being 6-foot-5, and could also play tight end in college. That’s an indication of his athleticism, not a projection of where he should play. He’ll have a lot to learn about playing the run, but this is a 5-star player as far as SMU is concerned. 64. WR Darrion Flowers, Sam Houston (Arlington, TX) – TCU: Flowers makes it into the 100-meter race with Humphrey. He’s an undersized wisp of smoke with homerun capability from the slot or as a return man. TCU is recruiting to put up points in every way possible as well as to stop points in every way possible. 65. RB Rawleigh Williams, Bishop Lynch (Dallas, TX) – Arkansas: Fantastic fit for Arkansas. He’s a between-the-tackles-run-behind-your-pads type of back with enough burst to get outside. I don’t see him breaking off 80 yard runs but he’ll be a very effective back in that offense. It’s sort of in the mold of the 90’s Cowboys offensive line and Emmitt Smith, just to give an idea. 66. OT Dave Bolisomi, Ryan (Denton, TX) – TCU: The intrigue with Bolisomi is his newness to the sport coupled with his length and baseline athleticism. Once his film started to circulate, interest picked up in a hurry. He’s a tackle specific player – always a premium on that – who will need significant physical development in his upper and lower body, but the potential is certainly there. 67. WR Jonathan Giles, Fort Bend Elkins (Missouri City, TX) – Texas Tech: If you look at the NFL and highly productive slot receivers, they often come from the hinterlands of college football. It’s a volume issue (more guys are ‘Y’ size than ‘X’ and ‘Z’), so evaluation is key. I think Tech is getting a great slot candidate in Giles. He’s slippery on the screen and in the open field. What I really like is he has just enough length and speed to play outside, too, in my estimation. Being a former quarterback who often improvised on the fly should make him a quarterback’s best friend when plays breakdown as well. 68. S Jamile Johnson, South Oak Cliff (Dallas, TX) – Texas Tech: Athletic enough to play corner against talented DFW receivers, Johnson should have good versatility within the safety position. Football is a numbers game and safeties have to cover man-to-man more than ever. I think he has some ability there. He’s also an intelligent player who is physical, though he won’t be the most explosive player on the field. 69. ATH Chad President, Temple (Temple, TX) – Tulsa: But we’re not talking about Idriss Deby. President’s de-commitment from Baylor upon Phillip Montgomery leaving for Tulsa tells me two things; he REALLY likes Montgomery, and he wants to be the No. 1 target. Going up against lesser defenders, the long, fluid receiver should feast and display more big play ability than he would have if he stayed in the Big 12. He’ll get a shot at QB with Montgomery which is what he wanted from the beginning. 70. DL Kingsley Keke, George Ranch (Richmond, TX) – Texas A&M: See Darrion Daniels. Keke relies on his overpowering strength too much at this point, but he does have good size and coordination. Fundamentally he has a long way to go. 72. RB Tristian Houston, North Shore (North Shore, TX) – Texas: Shows the traits for one-cut, outside zone running, namely feel for the cut back and one-cut and go decisiveness. He has solid acceleration, a good, sturdy build and will fight for yards upon contact. 73. LB Nathan Fox, Clear Lake (Houston, TX) – Northwestern: Every time I watch Fox’s tape, I can’t figure out why more schools aren’t in pursuit. No matter, I’m guessing former Northwestern linebacking great and current head coach, Pat Fitzgerald, will know what do with him. Fox makes plays all over the field and in special teams, and shows great acceleration when it’s time to make a play. I’m a fan and I think he has a great career. 74. OT Trace Ellison, Centennial (Frisco, TX) – Texas Tech: The first things that jump out are size and nastiness, but I also think he’s decently quick out of his stance. I’ve been back and forth on Ellison so I asked Halas what he thought and he thinks he may end up at guard. I think I see OT ability but guard wouldn’t surprise me either. Ellison’s No. 1 weakness is he plays too high. That’s bad any time, but especially when you’re 6-foot-6. That will be coached out of him and they’ll let the chips fall where they may, but he think he becomes a quality starter in Lubbock. 75. LB Alec Dunham, Coldspring-Oakhurst (Coldspring, TX) – TCU: When you only play two linebackers, they better be versatile. Dunham shows athleticism to cover and willingness to be physical against the run. He takes some poor, hesitant steps at times but who better to coach that out of him than Gary Patterson. 76. RB Devine Ozigbo, Sachse (Sachse, TX) – Nebraska: A natural runner with good feet, balance and vision, Ozigbo also has surprisingly deceptive speed for carrying 225 pounds on his 5-foot-11 frame. With loose hips, and solid burst, I love seeing him plant and go. 77. S Niko Small, Bowie (Arlington, TX) – TCU: An obviously smart and instinctive player, Small projects to deep safety for Gary Patterson. He’s not an electric athlete like some others in the class, but his intelligence helps him play fast. He’s not afraid to mix it up in run support; a must for a Patterson safety. 78. OG Zach Rogers, Hebron (Carrollton, TX) – Arkansas: A physical and mauling interior lineman, Rogers fits the woo pig sooie mindset to a ‘T’. He may have added value as a center if needed, because he doesn’t have ideal length at just over 6-foot-2. 79. QB Chason Virgil, West Mesquite (West Mesquite, TX) – Fresno State: A dual-threat with tons of high school experience, Virgil was originally committed to Mississippi State. Though he doesn’t have a big arm, he could improve strength with added size, much like former Bulldog, Derek Carr. If quarterback doesn’t work out, Virgil is athletic enough to play wide receiver. He’s a smooth runner in the open field with plus speed. 80. DE Breylin Mitchell, Round Rock (Round Rock, TX) – TCU: A strong-side defensive end, Mitchell has the frame to hold upwards of 270 pounds and play multiple gaps. For a bigger end, he shows solid speed to run the arc and get-off. I’ve always been a bit surprised Texas didn’t pursue. Mitchell should be ready to contribute fairly early in his career. 81. LB Richard Moore, Cedar Hill (Cedar Hill, TX) – Texas A&M: Moore’s a guy I’ve raved about a lot. But watching him this year made me think he’s more of an inside linebacker at the next level but in an outside linebacker’s body. Still, though undersized, he packs a punch and navigates traffic well. He’s also a sure tackler with short area burst. 82. LB Clay Johnston, Wylie (Abilene, TX) – Baylor: Johnston is both an athletic anomaly and your throwback traditional sort. He makes plays in pursuit, in space and in the wash. With his fluidity and short area burst, Johnston looks to excel as a hybrid-linebacker, or as they call it in Waco, the “bear”. I think he’s going to the perfect situation for him, something I always love to see. 83. LB D’Vonta Hinton, Texas City (Texas City, TX) Texas Tech: Sam Mills – an undersized inside linebacker who plays much bigger than he is. He may be the best Friday night ‘backer in the state. He just makes tackles all over the field and is relentless. He’s quick and an explosive tackler. If he was prototypical size, we’re talking Top 15 player in the state, but at 5-foot-9, I have some reservations. Like Johnston just one spot above, I feel like Hinton is going to the ideal scenario. He’ll cover tons of space in a league that creates tons of space. 84. ATH D’Anthony Hopkins, Cuero (Cuero, TX) – UTSA: Not sure why Hopkins doesn’t have more interest. Heading into the season I liked him as an athlete, mostly like him at linebacker. I now consider him very likely to stay at running back. A bigger kid with solid speed and fluidity, Hopkins also has surprising long speed. 85. CB Darrell Miller, Cedar Hill (Cedar Hill, TX) – Tennessee: Miller has the feet to stick with smaller, quicker receivers but also decent size, physicality, and ball skills to hang with the bigger guys. 86. ATH Mike Freeze, Graham (Graham, TX) – TCU: Freeze played safety in high school but he’s an obvious spin-down candidate in college where his speed and change-of-direction will serve him well. He’s a fearless striker who looks to get to 235 pounds with ease. With Patterson’s track record of switching player’s positions and developing them physically and mentally, I see some real upside in Freeze’s raw tools. 87. DE Landis Durham, Plano East (Plano, TX) - Texas A&M: My biggest question for Durham and A&M is I don’t think I see the fit. Ideally he’d play a Buck/Fox role as a player who rushes the passer and sometimes drops into coverage. I don’t see him as a full-time defensive end or a true linebacker, but there is a lot to like about his burst off the edge. He’ll need to add considerable weight to play traditional defensive end, or become more fluid in space to play linebacker. 88. OG Tyler Moore, North Shore (Houston, TX) - Minnesota: Two years ago Minnesota signed Alex Mayes from Van Alstyne. Last year they snagged Alex’s brother, Connor. In 2015, they landed Moore, a player who’s style reminds of Connor’s. Moore is a big mauler, plain and simple. He’s not a guy you’re going to put in space but he’ll move guys backwards at the point of attack. 89. WR James Proche, DeSoto (DeSoto, TX) – SMU: Great build, toughness, and hands for the slot. I never understood why Proche didn’t get bigger looks, though I’ve noticed a lot of the great NFL slots went to smaller schools. It seems like a lot of quality slot receivers get overlooked and I think Proche is in that category. New coach Chad Morris will be a godsend for Proche. They’ll be a godsend for each other actually. 90. WR Jalen Guyton, Allen (Allen, TX) - Notre Dame: Solid is the way to describe Guyton. He’s not big, but he’s certainly not small. He’s not fast but he’s not slow. He had a knack for getting deep and making big plays. Having an okay quarterback didn’t hurt, either. 91. WR Keke Coutee, Lufkin (Lufkin, TX) – Texas Tech: Here’s your Jakeem Grant fit. Coutee will be featureed in the screen game where his stop/start ability will get him out of congestion and into open space. Tech also likes to streak their fast slots and Coutee fits that need as well. Great fit for him and Tech. 92. RB Aca’Cedric Ware, Cedar Hill (Cedar Hill, TX) – USC: Ware is the running back version of Guyton. He’s not an inside guy, or an outside guy, but he can do a little of both. He has good lateral ability and top end speed and I think he sees running lanes well. I could see him become a 3rd down back, but carries will be tough to come by at USC, especially with Ronald Jones committed there. 93. DE Lonzell Gilmore, Spring (Spring, TX) – Texas Tech: Much of my fondness of GIlmore is his youth and projectable frame. He’s about 215 pounds now but he has tons of room to add bulk. If he keeps his movement skills with the added size, he’s going to see a lot of playing time. I imagine they like him as their Pete Robertson fit. 94. S PJ Locke, Central (Beaumont, TX) – Texas: Often listed as a corner, I like Locke at safety better. He plays with guile and will hit you but I don’t think he’s a corner athlete. He could be a nickel in a league where you can’t have enough secondary personnel. 95. WR D’Erren Wilson, Greenville (Greenville, TX) – SMU: If I was more familiar with Wilson, I may have him higher but I have seen only a little of him and don’t know anyone who’s intimately familiar with him. He jumps off the screen and I can’t for the life of me understand why he doesn’t have more interest. He’s quicker off the line than most other in-state receivesr and he’s just as likely to beat his coverage with his speed as he is his size and ball skills. I hope he sticks with SMU. 96. WR AD Miller, Bishop Dunne (Dallas, TX) – Oklahoma: A long, lean receiver with a huge catch radius, Miller makes some of the most ridiculous receptions you’ll find on Hudl. 97. TE Jess Trussell, Martin (Arlington, TX) – Purdue: Every year some no-name tight end from the state of Texas gets drafted. That could one day be Trussell. I love his all around game; he’s not just a blocker or just a receiving threat, he’s a nice mix of both. With added bulk and some refinement he could become a big time player. 98. DB Isaac Warren, John Tyler (Tyler, TX) – Northwestern State: Unless he’s in a heavy press-man scheme, I think Warren becomes a safety in short order, but if moved, he’ll have solid movement skills to be versatile within that position. He’s certainly physical with good size. Smart player, too. 99. S Montrel Wilson, Fossil Ridge (Keller, TX) – TCU: In a passing league and operating a defense heavily reliant on safety play, Gary Patterson is devoting numbers to the position. Wilson is a big, rangy safety who will hit. Could we be looking at the next Sam Carter? My main question on Wilson is his change of direction, but he checks a lot of physical boxes. One thing that made Carter special is his intelligence. I’m unsure of how football smart Wilson is. Nice starter kit, though. 100. OT Greg Long, Eastwood (El Paso, TX) – UTEP: If this kid lived in Houston or Dallas, he’d have 15 offers, but he doesn’t so he doesn’t. Good size at 6-foot-5 and 270 pounds, Long is good laterally and shows the willingness to finish blocks. I doubt he found many d-ends to challenge him in high school so he’ll have a steep learning curve in college but he shows a lot of raw, natural ability.